Music journalism means nothing to far too many people. Ok, he was talking about rock journalism in the Seventies specifically, but … small details. My point is that the craft is not taken seriously enough, even by the writers themselves. Last week I read a very interesting article in Crack magazine, written by The Quietus editor Luke Turner. In his short rant, Turner calls out the “age of beige” and asks, when did music journalism stop wielding the axe? All too often, we are presented with a sea of bland, agreeable three-star rundowns, publications seemingly in thrall to the artist and their click-baiting potential. Instead of challenging the reader and holding the artist to account, the aim is to be first – without offending anyone. To catch a wave and rack up those page views. Clearly, there is just far too much music out there and many platforms/publications prefer to devote their energy to saying positive things – understandable in these troubling times. But balance is important. Do we really need more gushing thinkpieces on the latest Beyoncé or Radiohead? Dig deep down into a subreddit or blog comments section and I’m sure will find some of the most heated and insightful debate on music. But the national newspapers, magazines and digital platforms such as Pitchfork still have great influence and responsibility. And they should go for the jugular more often, especially in this hot-or-not climate. Film critics like Mark Kermode don’t seem to have a problem with that, although he does enjoy himself a little too much. Today’s critic may be a Twitter handle and all the rest of it, but they no longer have the monopoly on taste. Their seal of approval carries less weight because it is open to challenges from all sides. The web has given voice to anyone with an internet connection. Whether you are in the thick of some obscure trap scene in Dubai, or live and breathe a particular twist of punk music in Chester, you have the means to start a conversation and stir a debate. What you certainly don’t need is a critic on their high horse telling you what to listen to or spend your money on. Does that mean that everyone is a critic now, that the professional muso should make way or, god forbid, join the marketing department? Hardly. It takes time, skill and knowledge to write a piece that cuts through the noise and makes an original point in an assured and reasoned way. “The best criticism takes the weaknesses within a piece of art and turns them against it, rather than personally attacking the artist themselves,” says Turner. “The critic has a duty to the artist to treat them fairly, to not go in ‘studs up’ with preconceptions. Yet beyond that, the journalist owes them nothing. Their responsibility is to the reader, and to themselves, to be honest and fearless, to tell the truth, and to do it with flair. But how do you become a great music journalist? What’s the secret? Scurrying around the web, I was told that Lester Bangs was the guy to read. 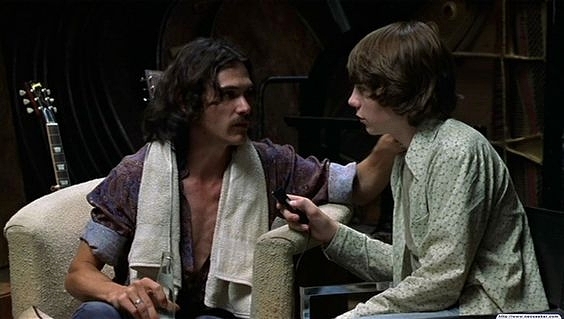 Coincidentally, I had just seen Cameron Crowe’s Almost Famous and couldn’t help but identify with the naïve and earnest 15-year-old lead, a character based on Crowe’s experiences as a young Rolling Stone hack in the Seventies. Philip Seymour Hoffman plays the charismatic, free-spirited Bangs, schooling young William Miller on the business and how to stay the course. The prolific Bangs was notorious for being a savage writer, one who would often double back on himself – presumably for his own amusement. In that sense, he represented the worst excesses of ego in the build-em-up-break-em-down heyday of rock journalism. Part of him, anyway. That said, the piece the changed it all for me was his review of Van Morrison’s Astral Weeks. I say review, it’s more a meditation, elevating an often routine and formulaic medium to the realms of great literature. This passage is Bangs at his absolute best: “Astral Weeks, in so far as it can be pinned down, is a record about people stunned by life, completely overwhelmed, stalled in their skins, their ages and selves, paralyzed by the enormity of what in one moment of vision they can comprehend. It is a precious and terrible gift, born of a terrible truth, because what they see is both infinitely beautiful and terminally horrifying: the unlimited human ability to create or destroy, according to whim. I dare you to listen to that album, read his article, listen again and not feel illuminated in the deepest sense. That review was written more than ten years after the album came out. And perhaps that’s what it takes to see between the notes. You have to take that album for a walk, live with it, feel it, experience it in the context of your life – the light and dark. In situations like this, the resulting conversation becomes more about the dispute than the work itself. Reviews of reviews quickly become tedious. As do cookie-cutter previews and first listens of tracks with barely any commentary or analysis. Again, just to be first. You – your life experience – could be the key to a whole line of inquiry. As was the case with Ann Powers when reviewing Daft Punk’s RAM for NPR. Here is some useful commentary from the 33 1/3 book How To Write About Music. In turn, a great writer can move the reader. Saxophonist Shabaka Hutchings wrote an interesting Facebook post back in the early summer, giving thanks for “the individuals who choose to write about music as artists”, the ones who “set a spark in his mind”. He goes on say those journalists “should fulfil the standards of good creative writing and use music simply as their medium”. In other words, look beyond the functionality and the formulaic. Express yourself. Make it an experience. Film critic AO Scott, in his book Better Living Through Criticism, argues that “The role of the critic is to resist the manufactured consensus – to interrogate the successful, to exalt the unknown, to argue for ambiguity and complexity.” So don’t be afraid to ruffle a few feathers and challenge this notion of objectivity. Stand firm in the face of hungry trolls and bruised egos. You can be largely positive about a review and still be critical. I thought Lou Reed did a great job with Kanye’s Yeezus. This was not a lecture. If anything, it is one big note to self. If you are thinking about becoming a music journalist, then say something. PS I may have been reading the wrong reviews and features. If so, which ones stick in your mind? Who are your favourite music critics? Let's start with the one-star gems and work our way up.